© Sir Anthony Caro. Photograph by R.H. Hensleigh..
After a brief but transformative sojourn in the United States in l959, Anthony Caro abandoned the small scale, modeled figures he had been developing in the 1950s and began to construct the abstract, welded steel sculptures that have been his métier ever since. Before his cathartic experience in America, London-born Caro had studied at Christ’s College, Cambridge (where he received a degree in engineering), Farnham School of Art, Farnham, Regent Street Polytechnic and the Royal Academy Schools in London. He also worked as an assistant to the renowned mid-century British sculptor, Henry Moore, from 1951–53. Like many artists rebelling against the Abstract Expressionism of the 1950s, Caro wanted his sculpture to look straightforward, not precious: “No art props, no nostalgia, no feelings of the preciousness associated with something because it’s old or bronze, or it’s rusty, encrusted, or patinated. So I just covered it with a coat of paint. I used brown or black paint and the sculptures looked more as if they were destined for a locomotive factory than an art gallery.” Through the 1960s, Caro developed and refined a sculptural mode characterized by horizontal extension, industrial metal materials, non-objectivity, absence of base or pedestal, painted surfaces, and a bold, affirmative spirit. His low-lying Coda, from the first decade of his audacious, new style, unfolds across the floor in a free, open-ended manner. Despite its heavy material—steel plates and I-beams—Coda’s metal components abut one another in cantilevered, hovering positions that nimbly defy gravity. Its overall form, from the point of view pictured here, descends to the arrow-shaped trapezoid in the foreground. To either side two I-beams, flanking a central, inclined, trough-like element, appear to float unsupported in space. Since “coda” refers to the concluding section of a musical score, the arrow form becomes the point toward which the assorted components of the work converge, while the sculpture’s rich brown hue reiterates the summary, weighty heft associated with a musical finale. Since Caro’s modus operandi in composing sculpture is to improvise from a stockpile of parts (in 1967 he had a cache of thirty-seven tons of unused steel from David Smith’s estate shipped to Great Britain), Coda’s sprightly articulation hinges on the unity and interdependence of its segments: the grounded trapezoid and perpendicular steel plate at the right form two stable poles fluently bridged by several intervening elements. 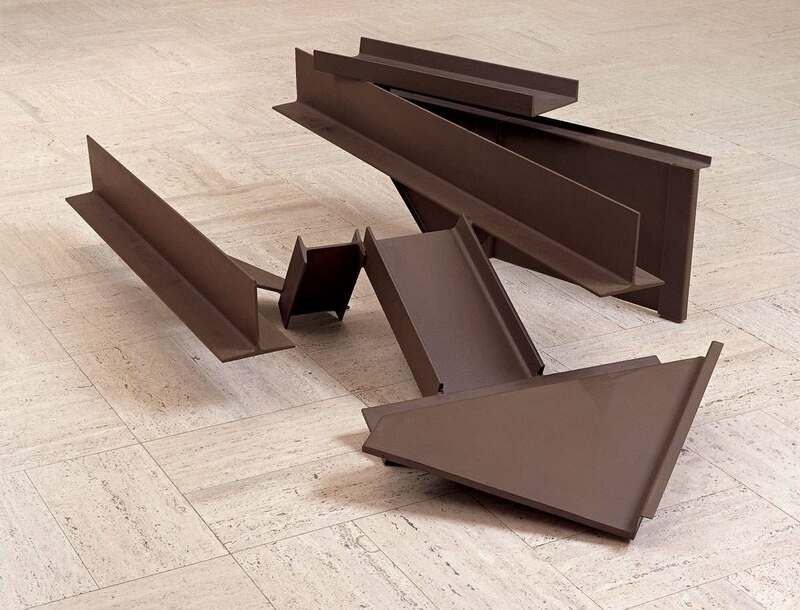 Though frequently connected to the reductive, international Minimalist style that dominated the mid-1960s art world, and though his sculptures are undeniably spare and distilled like much Minimalist art, Caro’s distinctively pictorial style and suggestive titles seem to defy the cool, impersonal aesthetic and monolithic gestalt of classic Minimalism.